‘I’m sure there’s lots of things but I can’t really think of anything that has been that challenging’ I had replied. This is probably quite telling, and sums up our trip very well I think. There has definitely been some challenging days but they have been far outstripped, and easily forgotten when I consider all the great moments. The human capacity to adorn rose tinted spectacles is quite amazing sometimes! Due to the nature of travelling by bicycle things of course go wrong and there are days where things break, we have to change plans, or one of us is a little low or cranky with the other. It’s rare for a day to go by without at least one of us getting a little frustrated. These frustrations are short lived however and are, more often than not, swept from our minds by a local we meet, a tasty lunch we eat or an amazing landscape view. When I consider how stressed I was in my last job I feel very lucky that we made the decision to come away and that even my worst moods are easily erased by something as simple as a hearty lunch. 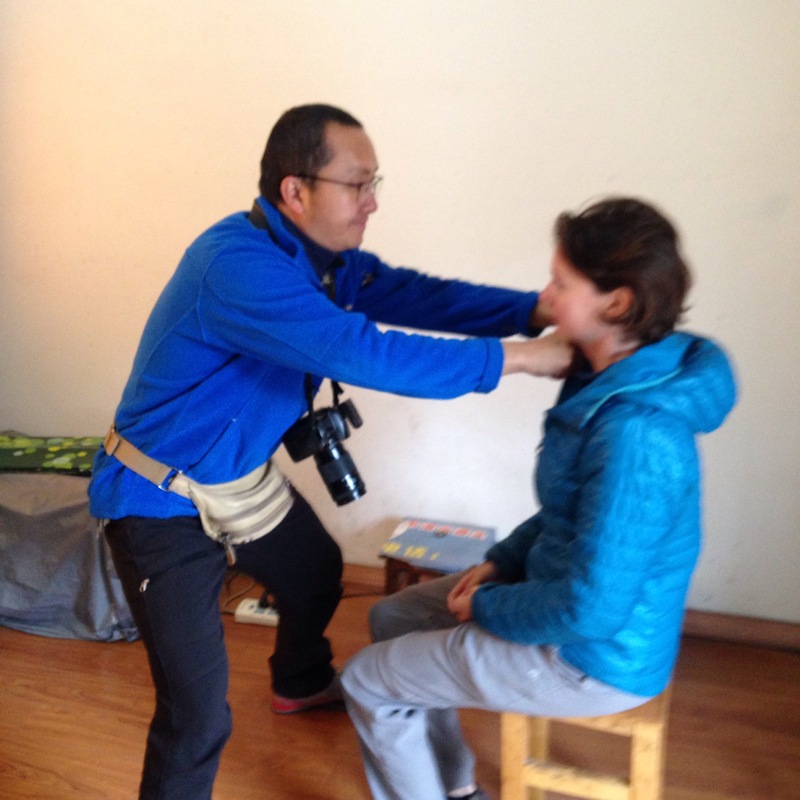 Our time in Lijiang is a good example of all this and has certainly been a mixture of highs and frustrating lows. We cycled into the sprawling white city of Lijiang at 5pm, pretty good going considering we had had a 110km day with two medium climbs. Before calling it a day and finding our hostel we decided it was worth making a visit to the PSB office (closes at 5.30pm) to ask about extending our visas. With the good news that it would only take three days, we could keep our passports while we waited, and that the visa extension would be added from the final date of our current visa (rather than the date we apply), we agreed to go ahead and get the extension over and done with here. We knew that applying for our visa extension in China would be a pain and would likely take the best part of a day. Firstly we needed to get an ‘address registration’ slip from the local police station. We were staying in a very cheap youth hostel near the Old Town which our cycle friends Geart and Systke had told us about. The upside of this was that we were only paying 40Y a night, the downside was that the owners had no understanding of why we needed to find the nearest police station. In the end they directed us to the nearest station (200m up the road) so after a quick home cooked porridge breakfast we cycled across to see if we could explain what we needed. After some painful English-Chinese communication the guys at this first station said they couldn’t help us and that we needed to cycle across town to the Xian Police station. 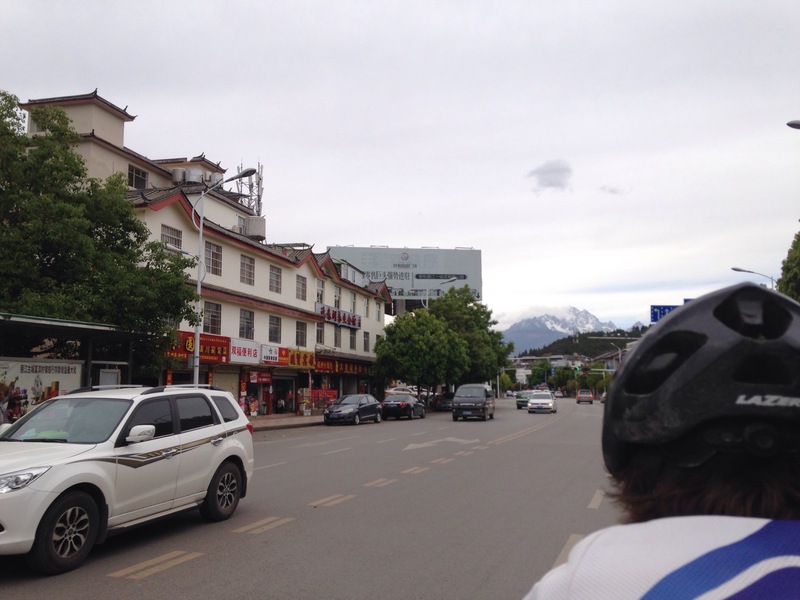 We hopped on the bike and cycled through the rain to the other side of Lijiang. It took us a good while to locate this second police station but once we were there at least the guy behind the counter seemed to understand what we were after. We were taken upstairs and we handed over our passports and our hostel’s address. 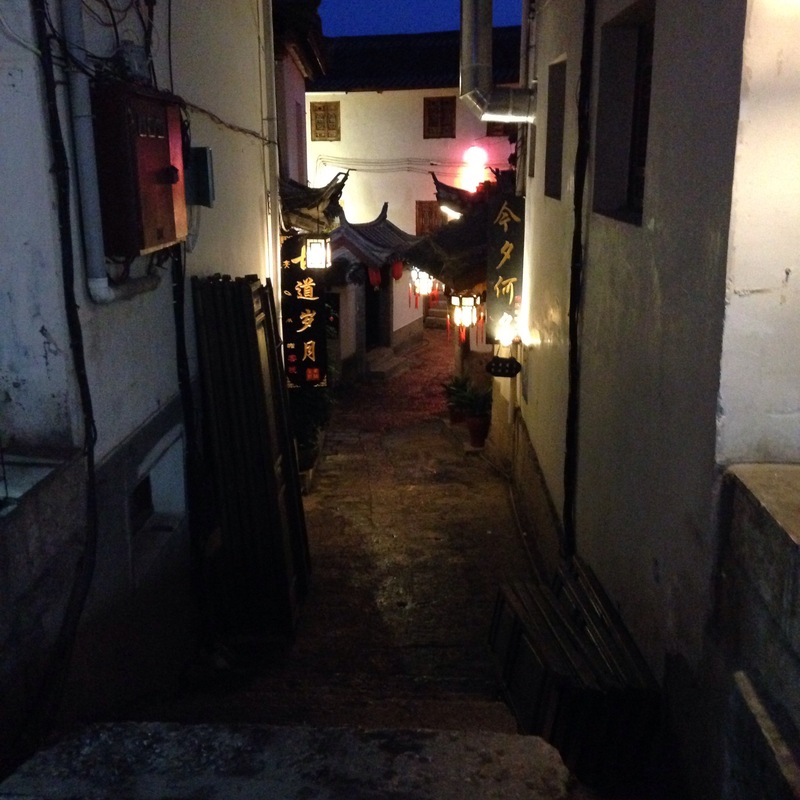 It soon became apparent that there was a problem and we were told that we were in the wrong place and that we needed to register at the police station in Changshui as that was the closest one to our hostel. We ask for directions, jump on the bike and cycle the full length of town again. Another annoying administrative hurdle we had to complete before we could apply for our visas is the need for ‘special passport photographs’ to be done (annoying we weren’t allowed to use some from our existing stash we had with us). Luckily, one of the two licensed photography places we needed to use was just around the corner so we could at least get this task completed without too much hassle. Being snapped – the photos were also photoshopped (Paddys shoulders got moved up and down and some blemishes on my chin and my rat tails hair got smoothed over! We then spend a painful hour trying to get cash out with our Caxton card from every ATM in town. I wait with the bike while Paddy admits defeat and goes to use our debit card instead. I sit down on a nearby bench where a bird presides to poo on my head. We spend the rest of the afternoon visiting the Merida bike shop where we tick off some of our shopping list – a new saddle and warm hat for me, fleece glove inserts, and a new helmet insert for Paddy. We like ticking things off our list and this combined with a good lunch means we’re back in a good mood again. We get back to the police station for 3pm and meet the lady who can issue the certificate. She frowns at the hostel address and then asks us if we have a telephone contact for them. We groan and check out watches. We have two hours until the PSB closes. We get directions and jump on the bike. We’re not allowed to cycle through the old town itself so we have to get off and walk most of the way to the police station. By this time it is raining heavily. When you are at the right police station, getting your registration certificate is a quick and painless task. We finally had ours but it had taken us all day to get this single slip of paper. We hurry over to the PSB office and hand in all our paper work. The man glimpses briefly at our certificate, nods, hands it back and proceeds with our application. All that for a simple 5 second check! Arghhh!! Those of you who are reading this after a day of frantic emails, report deadlines and perhaps cross words with your boss might be thinking ‘big deal’ but for us this was very frustrating. 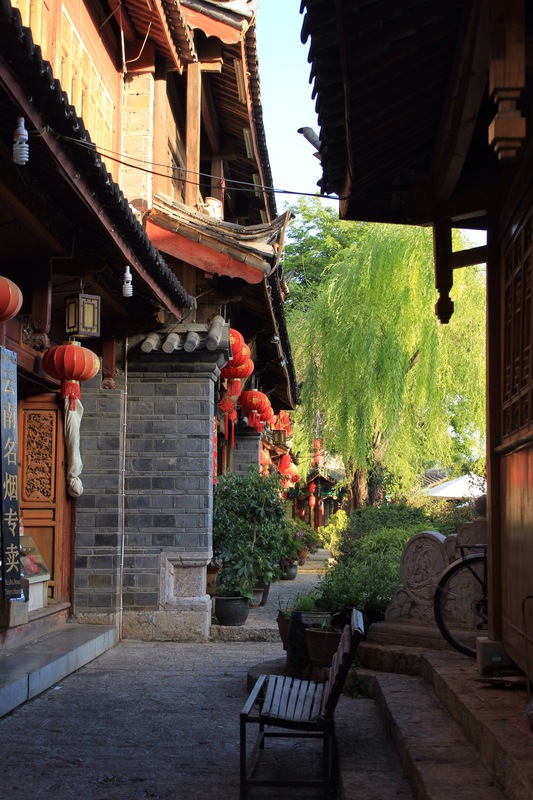 As I said at the beginning, our frustrations are often wiped away easily and we spent the evening blowing off some steam by enjoying a beer (and regular cap fills of 57% rice wine) while walking through the beautiful lanes which make up Lijiang old town. 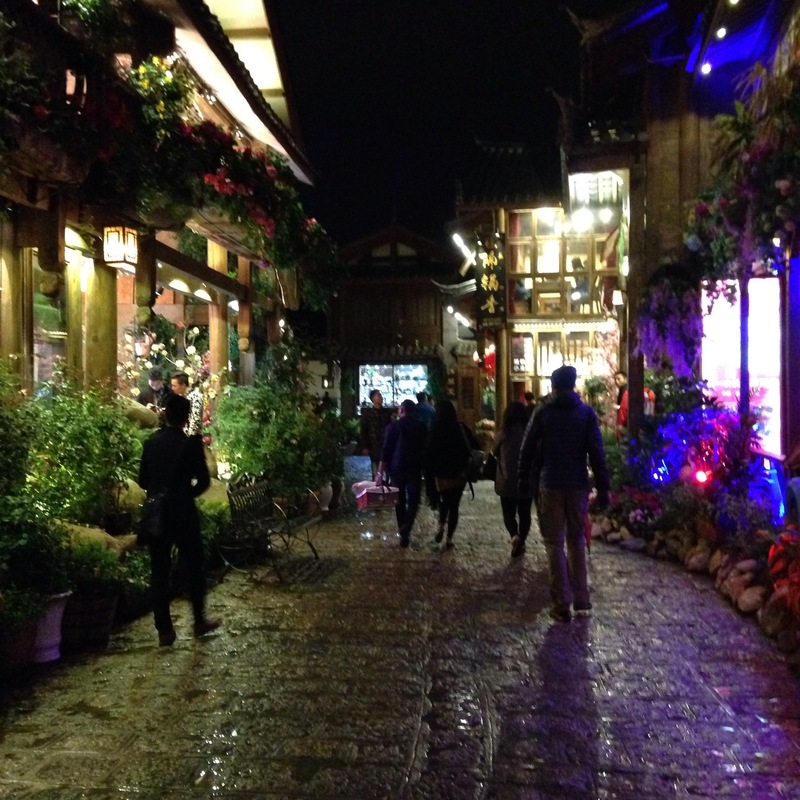 We walk through the cobbled streets lit by traditional red Chinese lanterns and cross over streams which are decorated with little floating ‘candle boats’ shaped like lotus flowers. The streets are busy with people and the stalls and live music make us feel like we are in some sort of festival. 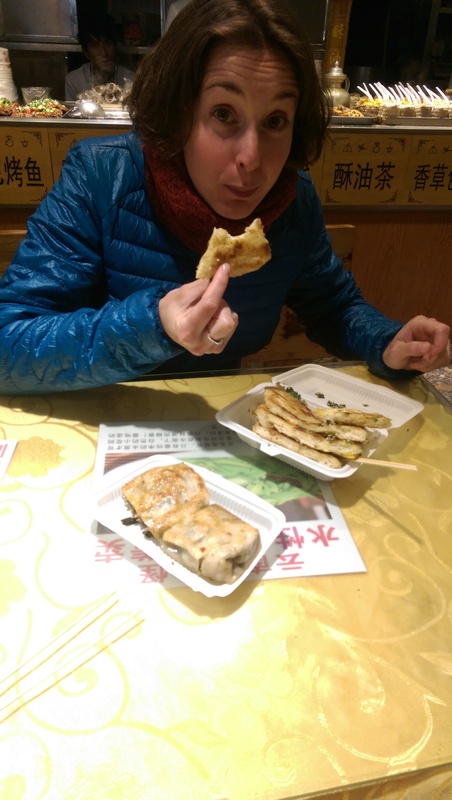 We gorge on a delicious street food meal of traditional spicy chicken stir fry, potato cakes, dumplings and Naxi ‘baba’ flat bread. We keep walking and reach a square and end the night by going to a very lively club which is filled with very cool, happy go lucky Chinese people. It’s a huge party, complete with a bouncing dance floor, balloons, a live DJ and (a rather terrible) MC. The drinks are 50y per beer!!!!!!! We buy one to share but are soon given another by the guy sitting next to us. We return the kind gesture and quickly make friends by sneakily passing shots of rice wine to him. It’s amazing how quickly we find our party personas again and we’re soon up on the dance floor pulling some shapes and providing a lot of entertainment to our fellow clubbers. Unfortunately we didn’t take any photos because we were having such a great time. There’s nothing that a good dance can’t fix!